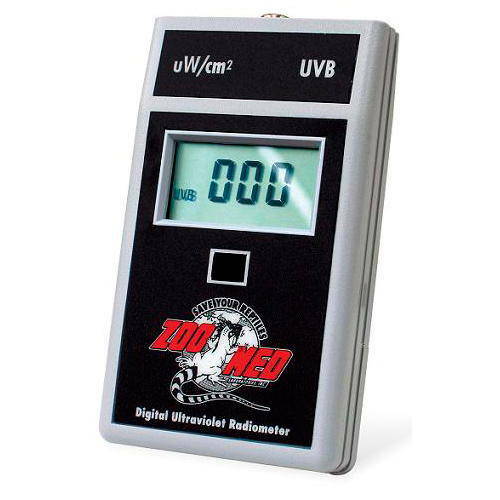 The digital meter of ZOOMED UVB is a device which measure ultraviolet radiation from type B in microwatts per cm2. The intensity of UVB rays that emits a light decreases with the passage of time, still recommended their substitution when it does not offer minimum values of 15 w/cm2 in the zone of influence for the reptile. This meter will allow us to check the performance of any UVB lamp and the timing of his replacement. It is very easy to use; simply points the circular sensor at the top of the unit towards the source of UVB radiation, hold down the button and read the result that appears on the LCD screen. According to the distance where to place the meter, you will get different readings; If you want to know the amount of UVB radiation that your reptile is receiving, hold the radiometer under the lamp at the height of the spine of the animal pointing toward the light. Always remember that the lighting is very important for reptiles, especially with regard to the emission of UVA and UVB radiation, fundamental for the well-being and the metabolism of calcium in these animals. The lack of UVB causes the calcium from food is not absorbed properly and the animals develop metabolic bone disease, which can be deadly if not stopped in time.